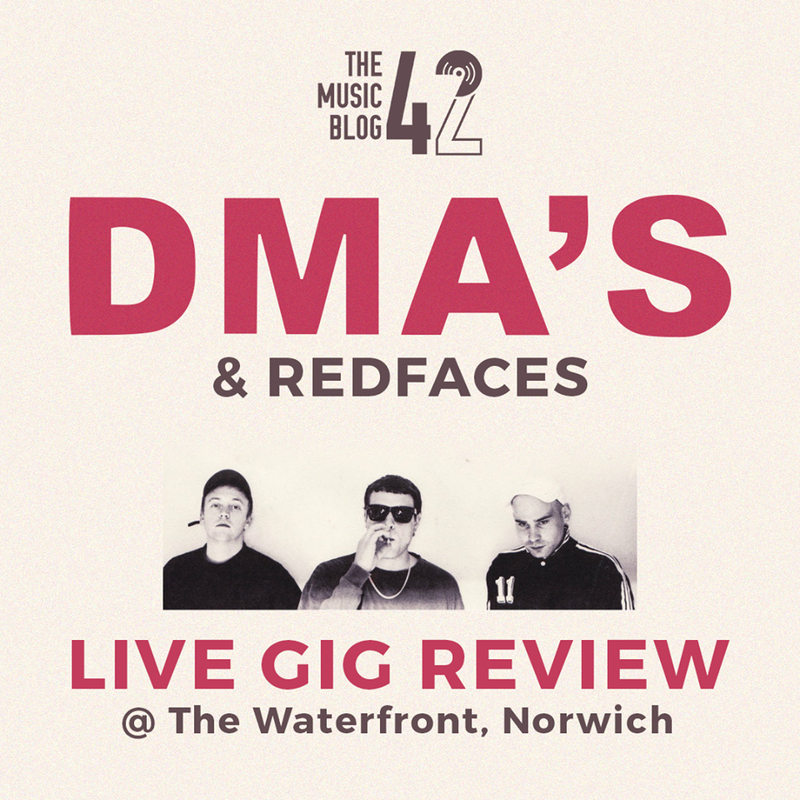 Australians DMA’s had the crowd in the palm of their hand with an electric set at The Waterfront, Norwich on Monday night (31/07/17). Support act RedFaces kicked off proceedings with their indie-rock filling the always fantastic venue, the tracks Kerosene and Glass Half Full being a standout from their performance. Destined for big things, surely they have their own headline tour and debut EP coming up in the next few months. DMA’s were on stage shortly after. A rather subdued entrance curtailed by the swarming FIFA 17 track Play It Out, the loving crowd knew they were in for a treat. The band went on to play the next five tracks consecutively with minimal crowd interaction, absorbing the Britpop sounds on Too Soon and In The Moment. However, when frontman Tommy O’Dell did talk, he spoke of his admiration for the crowd coming out to see the group, jumping straight into the euphoric Straight Dimensions. What I love about seeing live music is that it makes me love specific songs more. In the past, Late Night (Foals) and A Night On The Broken Tiles (Circa Waves) have been a staple on many playlists I’ve made after their live performances. Tonight, tracks like Melbourne and So We Know made me appreciate the fact that DMA’s had travelled the 16,000 miles from Sydney to perform. The real stand outs from their set were crowd favourites Step Up The Morphine and the beautiful Delete, two slow but mesmering ballads that the crowd sung along to word-for-word. Two of their best songs, hands down. The band treated us to a new song, Dawning. If you were expecting another Delete, their huge debut hit which garnered extensive radioplay on Australian radio show Triple J, then you’ve come to the wrong place. Dawning is a full throttle pumping Australian rock track, oozing with the tones of Timeless, another track which was passionately sung back at O’Dell by the buzzing crowd. The encore consisted of the track Laced, taken off their self-titled EP along with early set track Feels Like 37, and the meaty Lay Down which had the whole crowd dancing and singing, full of admiration for the Australians on stage. An epic performance, short and sweet at just under an hour on stage, but still so so memorable. The band even stayed around at the end to sign autographs and take pictures with their loving fans, showing how humble they are to be in this position. The word ‘underrated’ springs to mind instantly, singalong indie tracks, stage presence, and the fact they sound even better live. Australia’s answer to Oasis? Bold, but likely. DMA’s debut record Hills End is available to stream here! RedFaces’ new track Wise Up is also available to stream here!